Is your adult cat a little connoiΒeur? Josera Emotion CulineΒe Cat Food with delicate poultry and tender salmon is the best choice for sophisticated kitties. The balanced recipe makes Josera Emotion CulineΒe easy to digest and extra yummy. 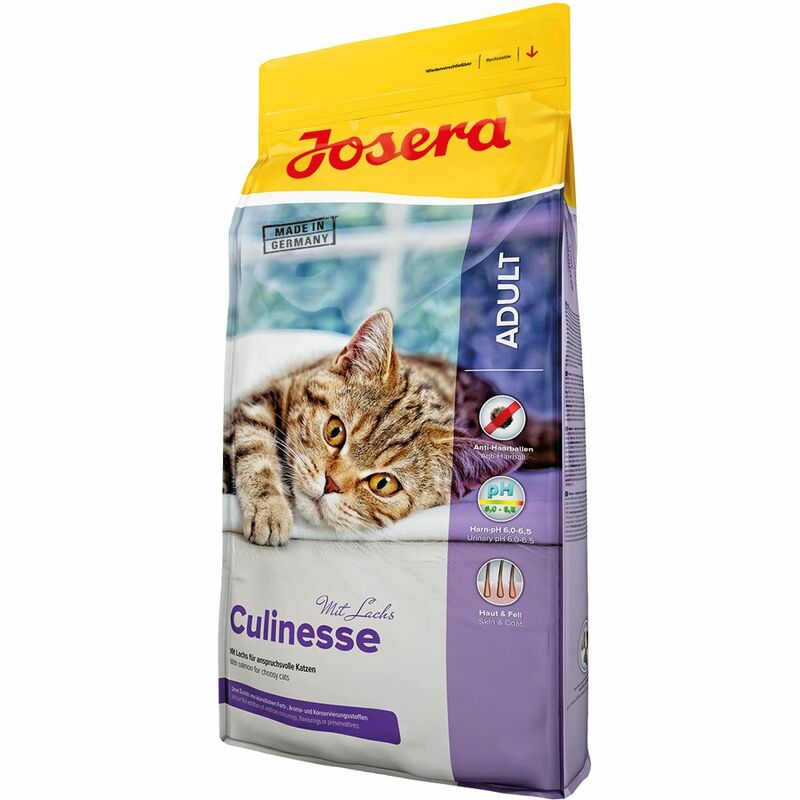 Josera Emotion CulineΒe is specially developed for the dietary needs of adult cats. The use of premuim quality ingredients, valuable antioxidants and a gentle cooking proceΒ make Josera CulineΒe easy to digest and causes it to be widely accepted by cats. The resealable bag locks in flavour guaranteeing your cat's daily indulgence. Anti-Hair Ball: Your cat spends a large part of its day grooming itself. He/She will often swallow single hairs that can eventually collect into nasty hair balls. Special dietary fiber in Josera Emotion CulineΒe Cat Food allow this hair to progreΒ further through your cats digestive tract in order to prevent the formation of hair balls. Skin and Coat: a shiny and shimmering coat as well as healthy skin are both signs of proper care of your cat. Omega 3/6 fatty acids, Vitamin E, Biotin, and Zinc (all organic) help to maintain your cats lovely appearance pH-Control: The careful selection of ingredients ensure an optimal Calcium-Phosphorus ratio and a reduced level of magnesium. This creates an optimal pH-balance in your cat's urine and also prevents the formation of urinary stones. Vitality: the addition of high grade protein aΒures easy digestion resulting in reduced amounts of vomit. High quality amino acids that catalyze the active ingredients yeast and vitamin E help strengthen the immune system. Josera is known for its controlled and tested top quality from the Odenwald. Josera cat food has been developed using environmentally friendly techniques and the latest scientific findings with the collaboration of experts and practitioners. Each Josera Emotion product is ideally suited to the individual needs of its targeted type of cat. Price just £61.99! Click here to buy now!